The act of writing down a birth story can initially seem like a daunting task, especially if you have had a traumatic birth. It can feel too hard to take yourself back into that scenario, to recall the happenings of that day, and as though it might make things worse to dredge up painful memories. We understand – yet we also know that this process has been a powerful healing step for many women. When women attend Birthtalk for the first time, they are often a swirling mass of emotion, struggling to figure out where to start with their healing, and trying to understand what has happened to them. Often the details and the order of events at their birth can feel hazy, with confusion about timings and when certain things occurred, even uncertainty about what was said and by whom. Part of the healing process is to pull apart the birth to separate the emotions and the events, but it’s hard to pull apart something that has not yet been ‘put together’. So we often encourage women attending their first meeting to consider writing their birth story, as an important early step on the path to healing. The process of putting together the factors that make up their birth often provides a new clarity that can in itself ease some intensity. The exercise also means that the woman now has her own documentation of ‘what happened’, and this document can act as an important tool for further understanding her experience. The process of putting together the factors that make up their birth often provides a new clarity that can in itself ease some intensity. In the first instance, many women just write the story as it happened for them. They might start their story from the moment when their labour started or when their waters broke, or when they were hospitalised for high blood pressure in the last weeks, or similar. This can present itself as a ‘stream-of-consciousness’ type of writing, where the woman just begins, and follows the story where it takes her, not worrying about punctuation or grammar, just allowing the story to unfold. How did your labour start? Where were you? Who were you with? How did you feel? Did anyone say anything that stands out to you? What were your thoughts? Did your birth start with a complication that involved hospitalisation? Maybe you can begin by writing about the complication, the options suggested to you (if applicable), your thoughts as you negotiated this, and the events once you were admitted to the hospital. What was the series of events that led to your baby’s arrival, once labour had started, or a decision had been made about how your baby would arrive? Who was there? What do you remember feeling about the people present? What stands out to you about that part of the birth? Even if you are not sure of the order of events, just write it as you remember, as those details can often be checked up later and the story amended. For now, it is just an opportunity to get it all out ‘on paper’. If some aspects of your story feel to ‘big’ to tackle just yet, that’s okay. Maybe beginning with another part of your story might be better for now, until you feel able to write about anything that was particularly traumatic or intense. You might find it helpful to seek the support of a friend, your partner, a birth worker or counsellor to be there for you as you recount difficult events. If you are having trouble getting words down, maybe you could just write about the part of the birth that is playing on your mind right now. It may be that the act of writing down this part of the birth that is really troubling you may open the gates for the rest of the birth story to flow out once you’ve started. You can focus on the pertinent part of your story for the moment, and write the rest of your story around it, perhaps at a later time. If you feel that writing anything is too difficult, you could consider perhaps using a voice-to-text tool, where you talk and the device translates it into the written word. There are apps that have this function, such as Dragon Dictation, a free voice recognition iTunes app available for iPod Touch, iPhone and iPad. It may be that when you are free of the writing process and can just talk, the words may flow more easily. The written story of your memories of the birth is incredibly important, as it is a representation of your experience of your birth. It provides important information about how you have recalled the experience, and what stood out to you. It may reveal your interpretation of snatches of conversation or your understanding of reasons for decisions of health carers. It may include your emotional response to events happening to you, and events going on around you. This information can be a vital clue for you and those supporting you, in understanding more about your experience. This raw version of your story now is available to you for use in exercises to deepen your understanding and shift you to a new place of healing. Writing the birth story in freeform is actually just the starting point to this exercise. Once you have a basic outline of the events that occurred, it’s time to ‘colour in’ the rest of the story. This step involves getting very clear about the order of events, and finding out more about what was happening in the birth outside of your own experience. After a traumatic birth, many women express feelings that the birth was not ‘their’ birth – that it belonged to the doctor, or the hospital, or the midwife, but not to the woman herself. This can be hard to express, as it sounds strange, yet really, it makes a lot of sense. Writing your birth story can be an important part of ‘returning the birth to its rightful owner’ – you! We call it ‘reclaiming your birth’ and it’s important to know why this step can be so helpful. Often, women describe feeling that their birth was ‘done to them’, rather than it being a case of them ‘doing it’. This is an important distinction, as we have found both of those feelings have outcomes postnatally. Having things ‘done to you’ in birth can be a disempowering experience. It does not instill confidence in your capabilities or in your body’s capabilities. It also does not acknowledge that you are the mother – the most important stakeholder in this birth. However, when the woman is ‘doing it’, she is the key player in the team, she is making decisions, working with her health carers and support people, being involved and owning the birth. This is how nature designed birth to be…but it is not how our health system or even our culture sets women up for birth. Most women don’t know the impact of all this before they have babies. Birth was designed for us to be ‘doing it’ in order to gather the gifts that nature intended from birth. These gifts enhance the discovery of our strength (physical and mental), our patience, the ability to be flexible and to surrender to the moment – all important skills to have with tiny babies and toddlers. Unfortunately, having a birth where things were ‘done to you‘ – even if they were life-saving things – can result in a woman feeling out-of-control, confused, frightened or even just like she wasn’t important in the process. And we have found, for the women we work with, this can have implications postnatally, resulting in women experiencing disappointment or emptiness, a lack of confidence with mothering, being hypervigilant in the care of her baby, and feelings of failure. This process can have a powerful effect on your healing process; suddenly, the birth becomes yours and it often seems to somehow mend the broken timeline and restore the natural order of things. Suddenly, the birth becomes yours and it often seems to somehow mend the broken timeline and restore the natural order of things. Write the birth story from memory, as outlined above. Retrieve the birth notes from the hospital, doctor or midwife. 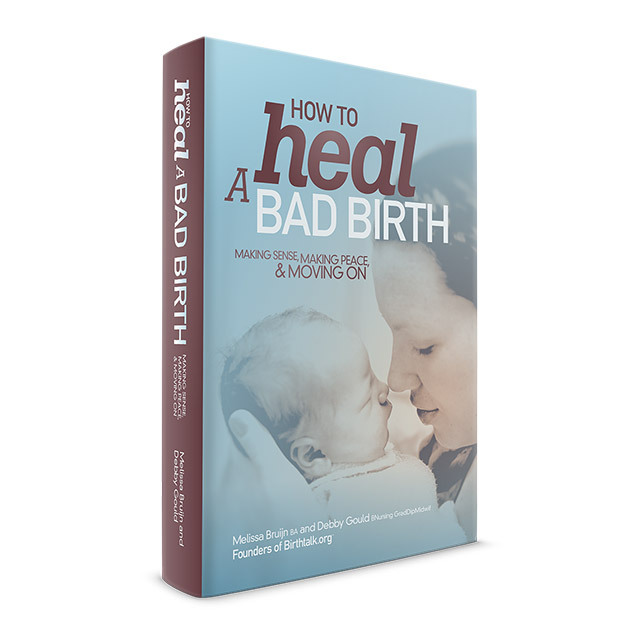 See another excerpt from our book, ‘How to Heal a Bad Birth’ : Retrieving your birth records: how and to get them and what to do with them . Write the birth story again using the birth notes as a chronological guide, and the notes from your support person or partner as an extra tool to try and get the wider version of your story as accurate as possible. Each of these steps has its own healing aspects, and can bring new revelations, new areas to grieve and new understandings about the event. Combined, these steps have the potential to enable you to arrive at a new relationship with the birth. It can become ‘your’ birth at last. The good thing is you will likely find nuggets of information during the process of writing your story that will help you know more about what you do and don’t want for any future births. You can reflect upon the kind of person you want to have as a health carer next time. You can reflect upon the kind of support you believe you might need in another birth. You can gather ideas about what worked and what didn’t at a time when you were your most vulnerable. And most importantly, you can then communicate this new understanding of your emotional and physical needs with your partner and health carers for your next birth, and work to find ways to get these needs met. You can read more about some tips for an empowering subsequent birth in this article of ours titled The Pitfalls of Going with the Flow in Birth. ← Birth trauma is real. It is possible to heal.